Occhio Solar is a video surveillance system powered by a photovoltaic solar panel that also charges a battery that allows the system to continue working during the night or periods when there is no sun. The system allows real time images and recordings of the monitored area to be remotely viewed. Remote - and safe - access to the system is possible using a PC, PC, tablet or smartphone. The transmission of the images is undertaken through the mobile telephone network, depending on the availability of coverage in the area (there must be mobile coverage in the area). In the case of intrusion or the activation of any other configured alarm (movement, sabotage, noise) the system sends an SMS and/or an email containing a video sequence. This feature can be remotely activated/deactivated. Solar power kit with 48h-72h autonomy. Controller/recorder and communications module with external antenna. Solar panel structure and support mast. The camera can be installed on this mast and the mast can be fixed to a wall or post (not included). The recordings can be remotely downloaded to be viewed or stored in backup copies. The machine’s configuration can be undertaken either remotely or onsite. Energy generation is permanently monitored and can be checked remotely. Occhio Solar is an easy way to remotely monitor places with no electricity supply or that are very remote. The fact that Occhio Solar can power itself means it can be easily and quickly installed, guaranteeing the system’s autonomy at night and on cloudy days. The alarm system detects intrusions at any time. These intrusions can be verified remotely, avoiding unnecessary travel to the site. Electric generation data (battery voltage, power generated, power consumed) is available on the system’s web interface, allowing the remote diagnosis of problems with the electrical supply (lack of charge on cloudy days, flat battery, etc.). Supervision and control of access to material storage areas. Supervision of work sites (fixed and itinerant). Creation of time-lapse videos of building processes. Surveillance of common community areas with no internet access. Remote detection of fires in pine groves and forests in general. Surveillance of locations without an electric supply. Occhio Solar is available in a Wi-Fi model rather than 3G for those projects where the installation area has a local Wi-Fi network. High intensity LED projector that automatically activates in case of an alert (noise, sabotage, movement in a preconfigured area). Additional batteries to increase the system’s autonomy in areas that are often cloudy. Data transmission via 3G (or Wi-Fi, depending on the model). Management from any standard web browser, pc or mobile. Images and video in the following formats: JPEG, Motion JPEG and MPEG-4, H.264. Mobile phone coverage in the area (or Wi-Fi, depending on the model). SIM card with a data contract from a telephone operator (For the transmission of images). OCCHIO-SLRF : includes a fixed general-purpose camera. Recommended when the area to be monitored is in a radius of up to 30m and night vision is not needed. OCCHIO-SLRF+ : includes a medium-range fixed camera (LED lighting, zoom, etc.) for more demanding monitoring requirements (viewing and recording with little light, zoom on a point of access…). OCCHIO-SLRM : includes a motorised medium-range camera with an 18x optical zoom. OCCHIO-SLRM+ : includes a motorised megapixel camera with a more powerful optical zoom (36x). Bespoke equipment: we can make and provide equipment with special technical requirements. Occhio Solar offers the possibility to adapt to the required needs of specific cases. If you need customised views, a personal interface, FTP mode or any other requirements, please consult us and we will give you a personalised solution. P: How much data is consumed by the transmission of images each month? It depends on the amount of hours during which the live images or recordings are viewed. In general, for the 3G versions, we recommend that you have a contract of no less than 2 Gbytes. P: Does it come with a mast to install the camera on? No. 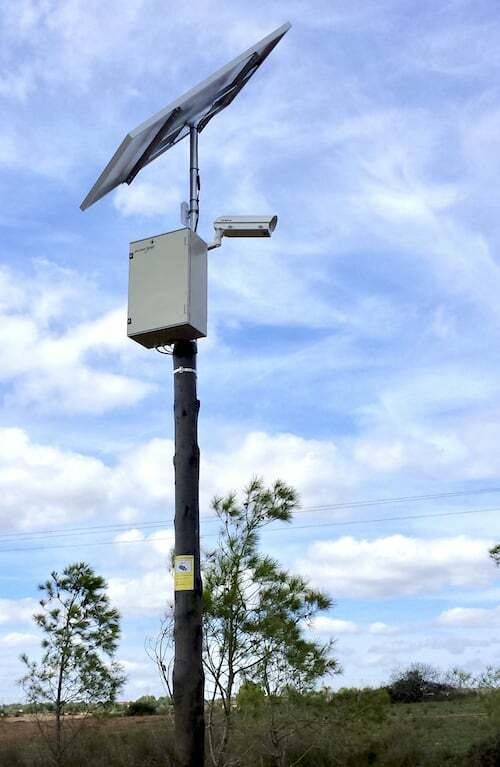 The mast that appears in the photos measures approximately 2m and is solely for installing and positioning the solar panels and should be fixed to a rigid wall or post (if they move in the wind the images will be blurred). P: How many cloudy days can the system keep functioning without going off? Each model is designed to have an autonomy of, at least, 42h-72h in very cloudy conditions. P: Does Occhio Solar work in any latitude? The inclination of the panels, in standard models, is 45º from horizontal position, which is suitable for the majority of regions, with the exception of the Equator and its surrounding areas. In order to install the system in other latitudes, we can supply systems with the best inclination in each case.